^ "Los Angeles Public Library Facts 2013 (for fiscal year 2012-13) | Los Angeles Public Library". www.lapl.org. Retrieved March 6, 2016. 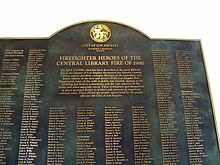 ^ "Board of Library Commissioners | Los Angeles Public Library". www.lapl.org. Retrieved March 6, 2016. ^ Toppo, Greg (June 2, 2014). "Libraries' choice: Change or fade into oblivion". USA Today. Retrieved March 28, 2016. ^ "EARLY HISTORY, DESIGN AND CONSTRUCTION OF THE GOODHUE BUILDING | Los Angeles Public Library". www.lapl.org. Retrieved March 7, 2016. 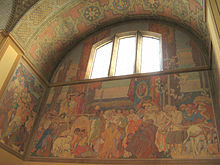 ^ "TOM BRADLEY WING: HISTORY AND DESIGN | Los Angeles Public Library". www.lapl.org. Retrieved March 7, 2016. 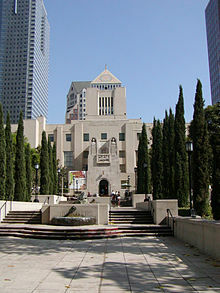 ^ "Los Angeles Public Library wins top award for cultural institutions". latimes.com. Retrieved March 7, 2016. ^ "National Medal for Museum and Library Service | Los Angeles Public Library". www.lapl.org. Retrieved October 26, 2015. ^ "About the Central Library". 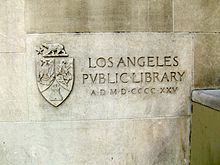 Los Angeles Public Library. 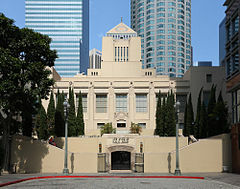 Los Angeles Public Library. Retrieved May 25, 2015. 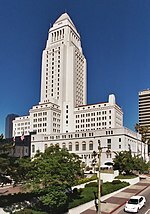 ^ "The Science, Technology, & Patents Department | Los Angeles Public Library". www.lapl.org. Retrieved May 3, 2016. ^ Group, Public Information Services. "Los Angeles, California". www.uspto.gov. Retrieved May 3, 2016. ^ Pool, Bob (October 19, 2012). "Saved from Dumpster: Amazing map collection makes librarians tingle". Los Angeles Times. Retrieved March 7, 2016.